And in here you can include not just types but also links to similar packages (family oriented, honeymoon, etc). This adventure-filled package features three boutique hotels known for their eco-friendly practices and closeness to nature. Enjoy mountains, volcanoes, and jungles with a hanging bridges tour and a rappelling experience. The first stop is at Rio Perdido, a hotel tucked in Guanacaste’s mountain range. Relax in the geothermal pool and indulge in some adventure with the many on-site activities it provides. Hiking trails, mud baths, river tubing and zip lining are just some of the options. It’s time to visit one of Costa Rica’s most famous landmarks. The conical volcano is the backdrop for your adventures in Arenal Kioro, a hotel surrounded by forests and gardens. 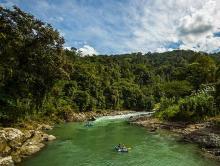 Here you can relax or explore the rainforest, but there is more to do in the area. Go on a hanging bridges tour to discover a lush woodland area from all types of angles, from their roots to their canopies. Pacuare Lodge is the last stop in this action-packed vacation. This is an off-the-grid eco-lodge so remote there isn’t any WiFi or TV in your rooms. Disconnect from the outside world and dive head-on into the jungle luxury experience. Inspired by the population’s closeness to nature, this hotel is an excellent choice for those who want to enjoy the wild with modern comforts. This is also the place where you’ll go canyoning. Rappel down one of the nearby creeks for the thrilling experience of a lifetime. 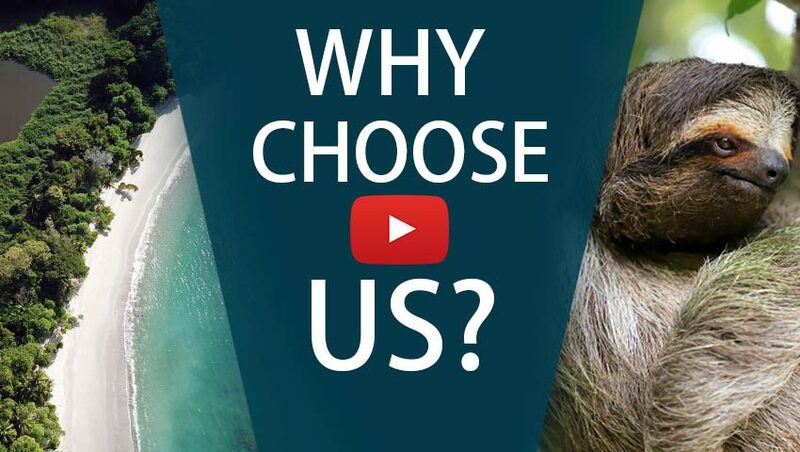 What’s included in ‘Costa Rica Eco Adventure’? 2 nights at Rio Perdido—Breakfast included. 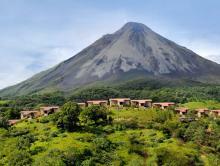 3 nights at Arenal Kioro—Breakfast included. 3 nights at Pacuare Lodge—Three meals a day included. Transfer from Liberia International Airport to Rio Perdido. Transfer from Rio Perdido to Arenal Kioro. Round trip from Arenal Kioro to the hanging bridges. Transfer from Arenal Kioro to Pacuare Lodge. Transfer from Pacuare Lodge to San Jose International Airport. Your Costa Rica eco-adventure is about to begin! Once you land at the Liberia international airport, a van picks you up and drives you to the first destination: Rio Perdido Lodge. This boutique hotel is located off-the-beaten-path. 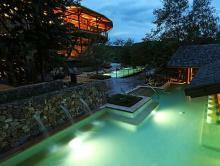 It boasts natural hot springs and many on-site activities. Settle down in your new home and enjoy the seclusion of your bungalow. Rest in the three geothermal pools on the property, and enjoy some of their thrilling activities. There’s a chance to go zip lining, mountain biking, hiking, and river tubing. It’s time to explore the extensive Costa Rica plains. Hit the road and head to the Arenal Volcano area and the town of La Fortuna. Here you stay at a quaint hotel that also has on-site hot springs. Enjoy the views of the volcano and the surrounding gardens and forests. Relax after the journey with a cocktail in your room’s Jacuzzi, and prepare for the adventure ahead. 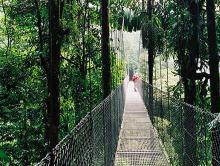 Explore the rainforest from different angles in this Hanging Bridges tour. Go up and down the mountain and its canyons while admiring the lush vegetation and the forest canopy. With an expert guide pointing out all the wildlife and plants of the area, this is a great occasion to learn about Costa Rica’s rich biodiversity as well as to snap great photos. This is a day for you to relax and indulge in what you crave the most. Be sure to try the on-site restaurants before the night falls, and visit the game room for a little fun with your companions. If you’d rather spend the day outdoors, hike across the property or explore the gardens. It’s time to disconnect from the outside world and immerse yourself in the jungle. The Pacuare Lodge is a secluded eco-friendly resort tucked into hills and next to a river. The hotel is so isolated there is no TV or WiFi in your room to help you forget about every day’s hassle. It’s also heavily inspired by the local native populations and their harmony with nature. The jungle always offers the opportunity to get yourself active. Explore the natural rainforest around the property with a canyoning tour. 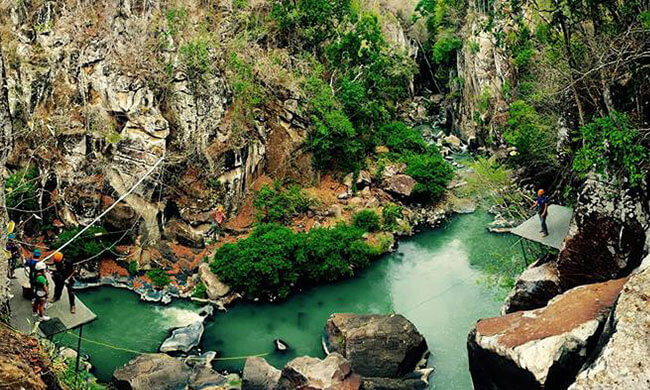 Hike through the mountain until you reach El Tesorito Creek, a narrow canyon perfect for rappelling. Practice first in its smaller rappels, and finalize with a 90-feet descent to the ground. After a day of adventure, it’s good to have some time to decompress and admire the view. The river gliding nearby is the perfect backdrop to sit back and relax. Enjoy the sounds of nature and the abundant wildlife of the area in an intimate connection with the forest. Go hiking to admire it up close or book a massage in the Jawa Juü Spa. After a hearty breakfast, it’s time to head out. Take a transfer all the way back to San José Just in time for your flight back home! This hotel is perfect for couples, friends, and families who want to experience hot springs, zip lining adventure, and less touristy destinations.